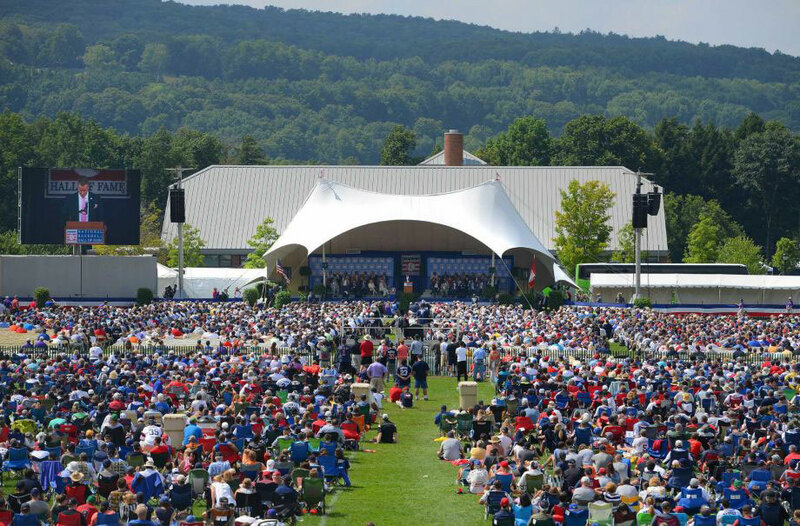 ﻿ Travel to Cooperstown for Induction Weekend - Sports Travel and Tours | Any Game, Any Place, Any Time! YOUR BASEBALL HALL OF FAME INDUCTION EXPERIENCE STARTS NOW! Click here to download a PDF Package Inclusion chart to select the best package for you. The four day Home Run Package includes an upgraded hotel, exclusive Sports Talk event, VIP Reserved Seating for the Induction Ceremony, HOF Member Autographed Baseball and admission to the Legends of the Game Roundtable. Our deluxe Grand Slam Package includes lodging in Oneonta, NY, exclusive Sports Talk event, VIP Reserved Seating for the Induction Ceremony, HOF Member Autographed Baseball and admission to the Legends of the Game Roundtable. The Base Hit is our standard Three Day/Two Night travel package and includes Hotel Accommodations at the Turning Stone Resort and Casino, Casino Free Play, Hall of Fame Admission, Awards Presentation, Parade of Legends and Lawn Seating to the Induction Ceremony. The Casino Extra Innings Package is just like the Casino Base Hit, but also includes an extra hotel night and Admission to the Legends of the Game Roundtable. The Infield Package includes upgraded VIP Reserved Seating for the Induction Ceremony. Looking forward to Induction Weekend? Our 2019 Induction Plus will get you to Cooperstown...and more! Start this baseball excursion in New York City. After enjoying retired umpire Al Clark and his Umps Eye View program, head out to the Bronx to catch two Yankee games with Tampa Bay and Colorado. While in NYC enjoy a city tour and stadium tour of Yankee Stadium. The next day we depart for Cooperstown. Enjoy the Hall of Fame, shopping and eating in town and the Hall of Fame Parade of Legends. On Sunday we are at the Clark Sports Center for the Induction Ceremony. We will head back to the Hall of Fame on Monday and enjoy the Legends of the Hall of Fame Roundtable discussion. Explore the northeast on this 11 day / 10 night baseball masterpiece that begins in Baltimore and finishes back in the DC area for easy air travel. We will work our way north to Philadelphia for a game and a cheesesteak before checking out the world champions in Boston. This baseball caravan next heads to New York City for a game in the Bronx. After enjoying these historic cities and stadiums and catching some great baseball, we head over to Cooperstown for Induction weekend. Celebrate the Class of 2018 at the Parade of Legends, the Induction Ceremony, and Monday’s Legends of the Game Roundtable. The tour brings you back to our Nation’s capital for a matchup between the Rockies and Nats. Historic landmarks, captivating cities and catching baseball history makes the Eastern Loop a must add to anyone’s bucket list! *Pricing and packages are subject to change and availability. Airfare to/from arrival airport not included. Click here for a sample image of seating choices (please ask your Travel Coordinator to explain the options). STAT is proud to stay in Albany County, New York for most Cooperstown visits.